Rovio Angry Birds Multipurpose File Holder 3 Tab Poly Folder 3pc Set Set included 1 binder , 2 o..
Rovio Angry Birds Highlight Highlighter Pen Set Set included 5 Color Highlighter 4mm wide, 2m..
Rovio Angry Birds Metal pendent Sharp Pencil Each Pencil has cute metal pendent (0.75in Height) o..
Rovio Angry Birds multipurpose poly Envelopes file folder Set Set included 4 pocket envelopes ..
Rovio Angry Birds Lock with Keys Comes with 3 keys and cute Angry birds rubber pendent Lock..
Rovio Angry Birds Red bird Pencil Holder / Organizer Box Wood construction with big Red Bird on ..
Rovio Angry Birds assorted metal Pin set Set offer as 3 pack , 12pc Pin size from 1in to 2.2..
Rovio Angry Brids Retractable jumbo Ballpoint Pens Set Made of durable plastic body with cute gra.. Angry Birds Stickers / Decal / Cling Set Set offer 3 Stickers sheets Each sheet size is 9.5in(.. 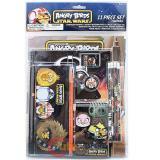 Angry Birds Star Wars 11pc School Stationary Set , Study kit Set included: 2 - Portfolios fold..